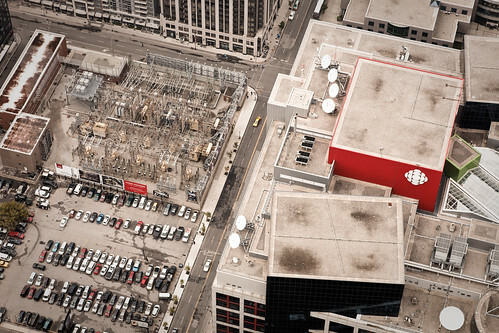 The Canadian Broadcasting Centre, viewed from above. Photo (CC-BY-SA) Benson Kua. To me, a license is a tool: it’s a means to an end. But that means that the tool ought to be doing the job you chose for it. After news broke that the Canadian public broadcaster CBC was moving away from Creative Commons, we launched on CDM into a somewhat informal (and occasionally heated) discussion of CC licensing and specifically the non-commercial restriction most musicians attach to their music. Here’s a summary of what I can conclude from those conversations. Abuse of non-commercial CC material is rampant. Very often, publishers and broadcasters think Creative Commons material with non-commercial licensing is free for them to use when it isn’t. Almost all publishers fall under the category “commercial” – even “public” broadcasters like the CBC. That’s not to say CC is a bad thing – abuse of copyrighted material is rampant, too – but if well-meaning publishers are abusing the license, it’s an opportunity to educate people. The CBC went to the opposite extreme. Tossing all CC music just because “most” is non-commercial doesn’t make any sense. There’s still a large volume of material that is explicitly free for the CBC to use that lacks the non-commercial restriction. It’s not hard to find, and the licensing – unlike NC – is very, very clear. Some of you apply “non-commercial” and it’s not what you mean. If you’re restricting uses under the license that are cases where you actually want people to be free to share, then the NC requirement probably isn’t a good idea. This is what ultimately prompted me to drop “NC” myself. Matching the license to what you want people to do is important. It’s like putting up a big “KEEP OFF THE GRASS” sign and then wondering why no one’s dropping by for a picnic. 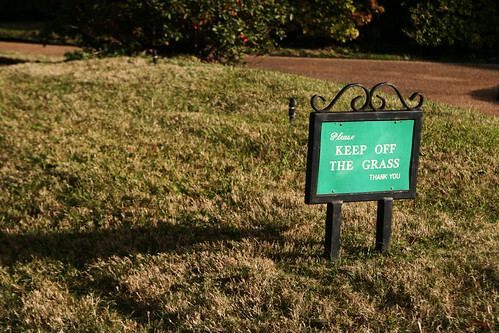 Conversely, if you don’t want people to have a picnic, it’s well within your rights to post a “KEEP OFF THE GRASS SIGN” — and if it’s your lawn, frankly, it’s not my business. It’s the same with your music or images. I still think that the non-commercial rule in CC is vague to a fault, though that’s best left to a separate discussion. And I don’t want to overstate my complaint. I believe the CBC is right – and I’m equally confident that CDM qualifies as “commercial” based on the previous CC study. So, the larger problem with non-commercial may not be that it’s unclear, but that it’s not understood – and that at least some of the musicians who are using it don’t understand the extent to which it restricts use of their work. It is good to know that the CBC will continue to use CC-licensed works in some cases, and their explanation of why not in others. And it is true that only a minority of CC-licensed music is released under a license that permits commercial use — for example, about 26% of the nearly 40,000 CC-licensed albums on Jamendo. However, as Michael Geist, Cory Doctorow, and many others have subsequently pointed out, CC-licensed music that does permit commercial use ought be allowed. If this is what you mean, great! If not, then maybe you should rephrase your sign. Make sense? Photo (CC-BY-SA) Quinn Dombrowski. Just as with production tools, I believe our role on CDM is to talk about how to best use the tools you want. Copyright, Creative Commons, public domain, open source, commercial, free, non-profit, whatever it may be can be a means to your end. So, I hope we’ll continue to follow this story and find some information that’s useful to musicians. Someone in comments brought up the question of whether the music is crap. But, you know, as artists, I don’t think you even know the answer to that question. Mostly you want to find a way to do something with your s***, and hope, at least, it’s good s*** someone enjoys. Carry on.